Arctic News: Is the North Pole now ice-free? Is the North Pole now ice-free? It could well be that, by the time you read this, there will be no ice left at all at the North Pole. 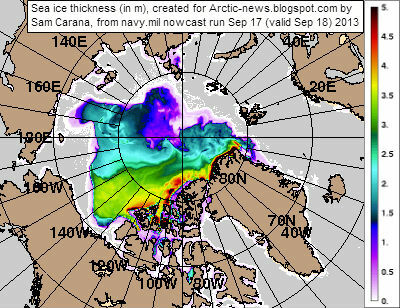 The image below, created by Sam Carana from a nowcast from the Naval Research Laboratory, run on September 17, 2013 and valid for September 18, 2013, shows open water extending all the way to a spot very close to the North Pole. Open Water In Areas Around North Pole (June 22, 2013), describing areas around the North Pole where sea ice thickness had fallen to virtually zero, i.e. open water. Open Water at North Pole (July 22, 2013), descibing a wide corridor that had developed with very thin ice between the North Pole and Siberia. The post added that surface water on top of this thin ice could extend along this corridor, all the way from the North Pole to edge of the ice, in which case the surface water effectively becomes part of open water. North Hole (September 2, 2013), describing areas close to the North Pole where ice volume had fallen to virtually zero, while pointing at how devastating the impact of sea surface temperature anomalies can be. This sea ice thinning in areas close to the North Pole has been one of the most important developments in 2013. Yet, many people keep watching sea ice extent. Why was Arctic sea ice not smaller in extent in 2013 than in 2012? The comparison below shows both volume and the extent of the sea ice for the same day in 2013 (left), respectively 2012 (right). Natural variability can make Arctic sea ice slightly smaller or larger than projected. There are many factors that influence things from year to year, such as weather conditions, sea currents and temperatures of the water in the Atlantic and Pacific Oceans; some factors are discussed in more detail below. 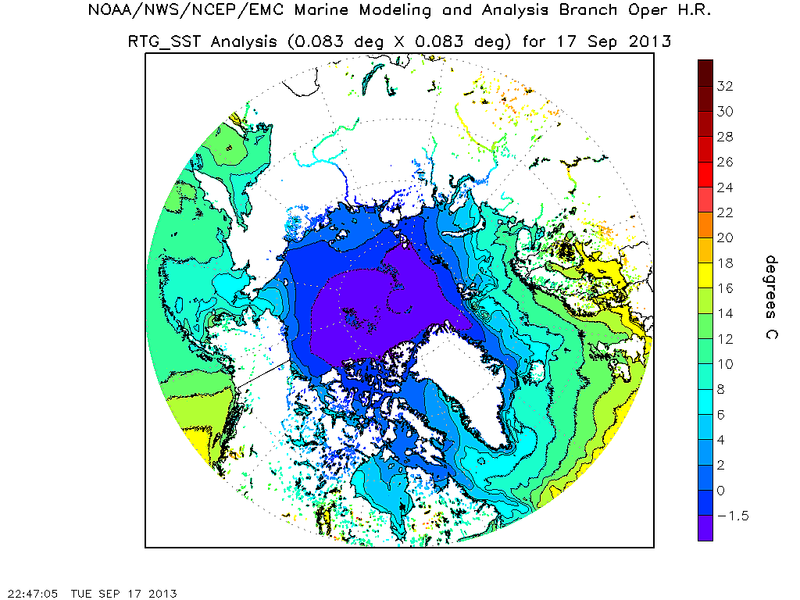 The above comparison shows a lot more ice north of Alaska in 2013 (above left) than in 2012 (above right). The comparison below shows that salinity levels in the Beaufort Sea were lower in 2013 (below left) than in 2012 (below right). Seawater typically has a salinity level of over 3%; it freezes at about −2°C (28°F). Where mixing occurs with fresh water runoff from melting glaciers and permafrost, the water in the Arctic Ocean can become substantially less saline. Other substances added to the water, such as sand, can also cause a freezing point drop. The freezing and melting point of fresh water (i.e. zero salinity) is 0°C (or 32°F). Less salinity means the water will remain frozen until the temperature reaches levels closer to 0°C. Heatwave conditions in Alaska caused greater melting of the permafrost. The result was more fresh water run-off through the MacKenzie River into the Beaufort Sea. This has contributed to keep sea ice extent larger in 2013. Yet, the warm water has also contributed to further thinning of the ice, reinforcing warnings that the sea ice looks set to disappear altogether within years. As illustrated by the above image by Neven, from the Arctic Sea Ice blog, average Arctic sea ice thickness (crudely calculated by dividing PIOMAS (PI) volume numbers with Cryosphere Today (CT) sea ice area numbers) has been very low in 2013. 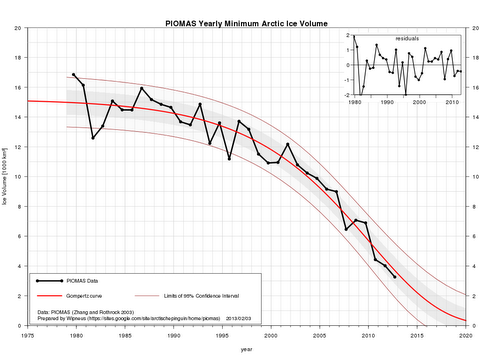 The image below shows that annual minimum volumes appear to follow an exponential trend downward to zero, firstly reached in September 2015, followed by zero ice in the surrounding months over subsequent years. Further measurements such as by CryoSat have confirmed that the PIOMAS data are indeed reliable and that the sea ice decline may well be even more dramatic. Natural variability goes both ways, it can either speed up or slow down ice melt. Had there been less runoff from the MacKenzie River, the sea ice in 2013 may not have been able to refreeze after being hit by cyclones several times. Next year we may not be so lucky and sea ice could disappear altogether, due to natural variability. Thick ice along the northern coast of Greenland is indeeed more persistent because of on-shore winds that cause the ice to drift and pile-up there. This would favor a Gompertz (or Sigmoid) trend in extrapolations (see image on the right). However, the new development of an ice-free North Pole shows that the sea ice is capable of breaking up abruptly, not only from the outer edges toward Greenland, but also starting at the North Pole and even moving from there toward Greenland. Moreover, as the 30-day animation below shows, thick sea ice north of Greenland can thin very quickly, suggesting it could well disappear altogether within one season. Earlier in 2013, much warm water entered the Arctic Ocean from the mouths of rivers, as discussed in the post Arctic Ocean is turning red. As said, this resulted in lower salinity levels in the Beaufort Sea that prevented cyclones from demolishing the sea ice altogether. Nonetheless, the joint impact of cyclones and warm water does appear to have caused rapid decline of the thick ice north of Greenland and Canada, as earlier discussed in an earlier post. Furthermore, sea surface temperatures have been recorded close to Svalbard that are far higher than even in the waters closer to the Atlantic Ocean. 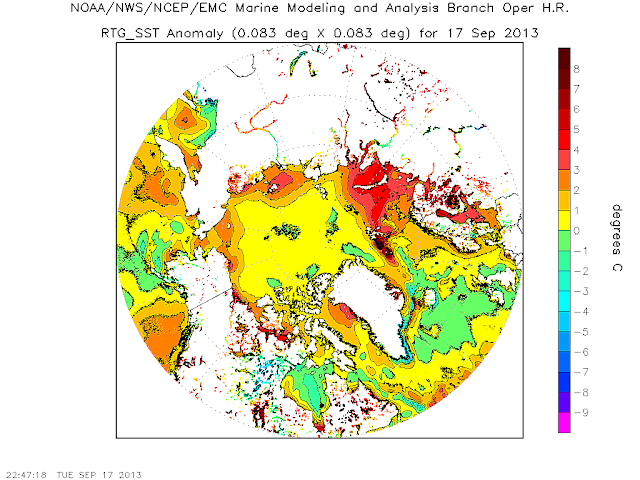 This phenomenon is illustrated by the image below, showing sea surface temperatures (top) and sea surface temperature anomalies (underneath). In some of these spots, sea surface temperatures are well over 10°C (50°F). Where does this heat come from? These hot spots could be caused by undersea volcanic activity; this is the more dangerous as the area has seen methane bubbling up from hydrates that have become destabilized; such dangers have been discussed repeatedly, e.g. in the post Runaway Global Warming. Hot spots can also contribute to even more dramatic thinning of the sea ice, including the thickest parts. In conclusion, there is no reason to assume that the sea ice in the Arctic will somehow magically recover. 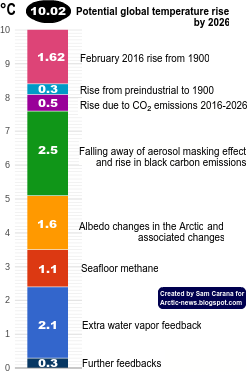 Instead, there are many indications that exponential decline of Arctic sea ice will continue. Less salinity may have temporarily prolonged the extent of the sea ice in some areas, but as sea surface temperatures keep rising, the ever thinner ice looks set to collapse within years, with dire consequences. This calls for comprehensive and effective action, such as described at the ClimatePlan blog. http://strata-sphere.com/blog/index.php/archives/19622 Looking at a lot of the data around the arctic especially the hot spots of 10c coming from lower depths of the thickest part of the of the ice mass looks like the volcanism has started the methane chain reaction already. How can we have any hope of stopping this with a world facing 2c even if we stop co2 emissions today. Are we ready for another Permian extinction. Stuart, that blog you linked is a classic denier blog trying to find other excuses for why the earth is warming besides the obvious one from 40% higher CO2 concentration in our atmosphere. Stick to real science, please! These hot spots could be caused by undersea volcanic activity; this is the more dangerous as the area has seen methane bubbling up from hydrates that have become destabilized; such dangers have been discussed repeatedly, e.g. in the post Runaway Global Warming. Hot spots can also contribute to even more dramatic thinning of the sea ice, including the thickest parts. 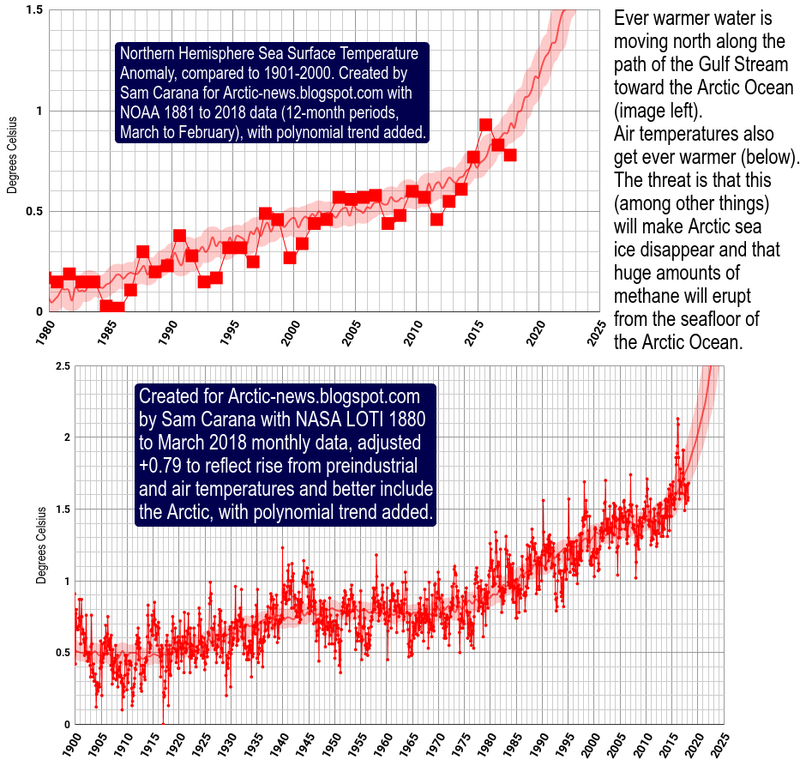 Hi John, Theres no way I am a denier but there seems to be more happening in the arctic than just global warming your own blog is making reference's to this. There's no doubt that we need emission cuts and further action to effectively facilitate the necessary rapid shift to clean technologies. Additionally (again additionally, i.e. not instead), we need to look at many ways to avoid warming in the Arctic. As the post says in its concluding sentence: "this calls for comprehensive and effective action, such as described at the ClimatePlan blog". reblogged in german: http://peakaustria.blogspot.co.at/2013/09/der-davon-galoppierende-klimawandel.html ddenial in europe is very deep, cause politicans do not want change they want to win elections not tell people to reduce their output.